A reformed and rejuvenated PiL battered a potentially cosy middle aged audience with some of that old spark, Getintothis’ Mark Greenwood reports on a frontman and group with a strong past and curious future. We can only marvel at the fact that anybody could pay for £25 for a PiL shirt. However, the merch stall appears sufficiently busy to justify a cynical and paradoxical attempt to squeeze the disposable income of a nostalgia seeking audience. 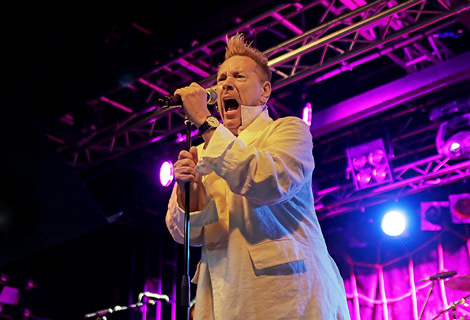 While we’re certainly not tempted to indulge in such frivolity, there is a definite, genuine buzz and excitement in the venue as we anticipate the appearance of the bourgeois anarchist and self-proclaimed anti-christ that is John Lydon. We’re not disappointed as PiL open with new(ish) material from their latest album, This is PiL. However, it is the inimitable Albatross that produces large grins and nodding heads. The band are on song tonight and the guitarist, Lu Edmonds cuts a curious and mesmerizing presence as he patrols the stage like a re-animated scarecrow. An intelligent and virtuoso guitar player, Lu provides the appropriate and eccentric guitar arcitectures that allow the sneering Lydon to engage in carnival-esque display fuelled on brandy and snot which frequently shoots out of his nostrils. The late and great Miles Davis once stated that Lydon approached singing in the manner that he approached the trumpet. This certainly rings true as Lydon comfortably maintains a balance and range of low guttural belches, high pitched vibrato warbles and soaring squeals. The craft of his visual and vocal performance secures him as a serious and consistent artist, able to sincerely enact a prolific back catalogue with fresh and new material. Songs such as This Is Not A Love Song and Rise bode well with slightly more obscure classics such as Low Life and Careering which are given fresh perspectives from an assemblage of accomplished musicians. While PiL are nowhere near as contentious or as hostile as they used to be, there is still a belligerence to be acknowledged in the throbbing bass drones, dub rhythms and malevolent guitars. Lydon remains visceral, enigmatic and beguiling, despite a clear affinity with Liverpool and his audience. 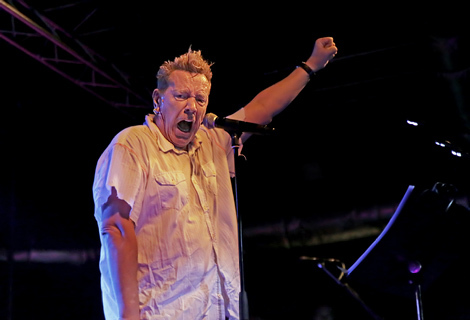 As we leave the gig to engage a downpour of biblical proportions, Getintothis can’t help feeling that we’ve witnessed a national treasure, despite a halo of nostalgia, and that Lydon is still very capable of inflicting a startling, if slightly obsequious, performance. Earlier in the evening, Ma Egerton’s, just a short walk from the O2, provides a couple of heavenly pints before our night of retro post-punk and vintage ska begins. Despite the corporate ambience of the O2, the sound is excellent as Getintothis arrive to witness a lively and memorable set from The Selecter. While the band may only contain a core of its original members, the place is rocking and Pauline Black demonstrates that the band are still very capable of moving the bodies of a bloated, middle aged audience. Obviously, classics such as On My Radio and Too Much Pressure stand out, reciting the soundtrack to a dystopian Thatcher-era and we’re immediately transported to a world of Fred Perry’s, braces, shiny Dr. Martens and suburban discos. 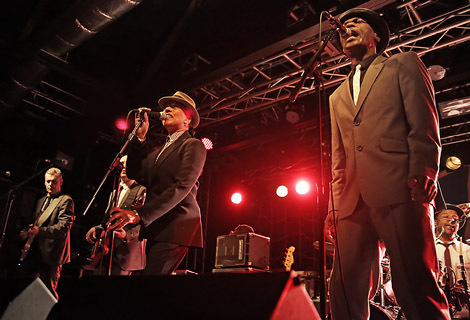 Credit to The Selecter – their set is polished, energetic and candid, with none of the usual lacklustre that often accompanies many reunited acts.